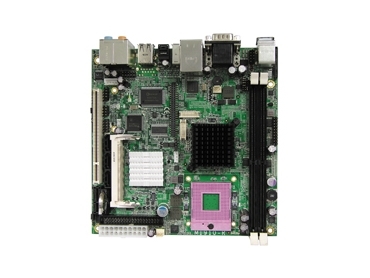 Backplane Systems Technology has released iBase Technology’s MI910 Mini-ITX Core 2 Duo board. The MI920 incorporates the Mobile Intel GM965 Express Chipset consisting of the Intel GM965 Graphic Memory Controller Hub (GMCH) and Intel I/O Controller Hub (ICH8-M), an optimised integrated graphics solution with a 533MHz and 800MHz front-side bus. Designed for gaming and high definition multimedia applications, the MI910 features an integrated powerful 3D graphics engine that is based on Intel Graphics Media Accelerator X31000 (Intel GMA X31000) architecture and operates at core speeds of up to 400MHz. Validated with Intel Core2 Duo fabricated on 65nm process technology, the 170mm x 170mm board supports two dual channel DDR2 667MHz DIMM sockets that can accommodate 4GB of DDR2 system memory. The MI910 supports Dual Independent Display and works with optional display daughter cards with 24-bit single or dual channel LVDS, 2nd CRT, single or dual DVI. Advanced networking connectivity and a high speed interface are provided by single or dual Gigabit LAN, two SATA ports, six USB 2.0 ports, two COM ports, 1394 and expansions slots including MiniPCI, PCI and PCI-E(x1) slots.